So, it's summer here in the Northern hemisphere, and in the UK (as with much of Europe), we're experiencing something of a heatwave. Central heating is probably the last thing on anyone's minds, so why a post about smart heating control? Well, our boiler recently needed replacing. When we moved into this house at the start of 2017, we already knew the boiler was old. With a bit of TLC we were able to keep it limping along for a while after the house move, but it finally died irretrievably last month. So, it was time for a new boiler. With a new, much more modern boiler installed, we enjoy several benefits. Our new boiler is far more efficient than the old one, so we'll save money on our heating bills. The new boiler is also far quieter than the old one, which is good for us, since it's installed in a cupboard in the corner of our kitchen. More relevant for this blog however, is that our Tado smart heating system can now control our boiler in more effective ways than before. Advantage number 1, is that Tado can control our boiler using digital communication. What does this mean? Well, with older boilers, a control system of any kind can tell the boiler when to run. If you have a standard themostat, when your house reaches the temperature you set, the boiler is turned off. Problem is that by that point, your radiators are still going to be hot, so the temperature will then overshoot. As the radiators and rooms cool, your boiler will then be reactivated. Of course, it will take a little while for this to happen, so your temperature will then fall below your preferred level, before coming back up, and likely overshooting again. The cycle will continue in this way. Adding Thermostatic Radiator Valves (TRVs) can help alleviate this problem, since they close down the flow of hot water into the radiator as the heat level approches that which you have set. With a modern boiler however, we can go further, through the aforementioned digital control. Digital control allows a system like Tado to actually tell the boiler how much heat output is required, and reduce it as necessary. In this regard, only the minimum necessary output required to heat your home is demanded from the boiler. This improves efficiency, and helps keep the temperature as close as possible to your preference, increasing your comfort. In Tado, you can of course see the heat level being requested represented as 'low', 'medium', or 'high'. It's likely more nuanced than that in the background. Tado will translate the levels requested from all the zones and rooms defined in your home, and request the appropriate level of heat from the boiler. Smart. Advantage number 2, is that we now have hot water control with our boiler. Why do we have, or even need hot water control with a combi boiler, when there's no separate hot water cylinder? Well, our boiler may be a combi, but it features a hot water pre-heat system. This is designed to counter one of the downsides with a combi, in that it can take a while for the hot water to actually start coming through when you open a hot tap. Hot water pre-heat is design to reduce this time, by keeping the hot water 'chamber' inside the boiler, warm (or hot if you like), ready to serve hot water quicker when the tap is open. If this pre-heat feature is left on 24x7 though, you're likely to use more energy than you would want to, since the boiler will keep running periodically to keep the hot water system pre-heated. Much better then to use a programmer to tell the boiler what times of day you typically use hot water, so the pre-heat feature only runs during those times. Tado however can go a step further. It does this by integrating it's geo-location feature. If you have a hot water schedule defined, pre-heat will run during those periods, but only when at least one person is home. 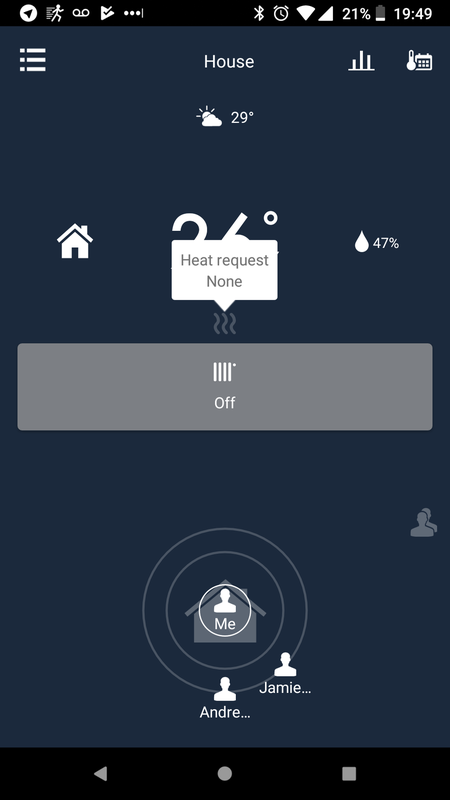 The Tado hot water feature lets you set a hot water temperature, but I've not been able to discern that this has any measurable impact on the pre-heat feature. It only seems to tell our boiler when the pre-heat feature should be active. If you do have a hot water cylinder as part of your system, and it has a temperature sensor, you'd be able to use Tado hot water control to heat your tank to your desired level. Prior to investing in our new boiler (a Worcester Bosch if you're interested), we contacted Tado to confirm the model we were planning to buy would be compatible with Tado digital control. Tado's support response was excellent, giving us all the information we needed, and even supplying setup instructions in case we were planning to do the integration ourselves. They also offered to do it for us by making the adjustments to our configuration remotely if we preferred. I can't praise their response enough - excellent service. If you're looking to have a new boiler installed, and have, or are planning to have Tado installed, then you can check if the boiler you're considering is compatible here on the Tado website, or contact Tado support for help. Now, back to summer, and focussing more on how lovely it might be to have Air Conditioning right now!